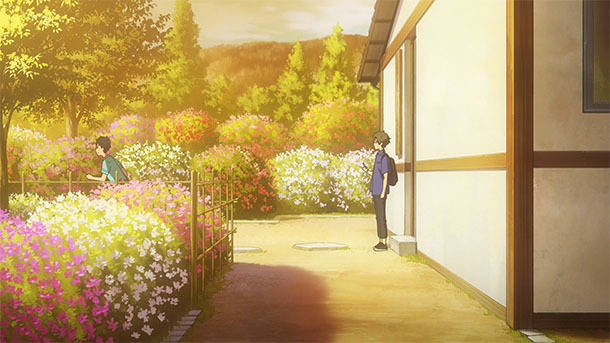 Welcome back to a new season of anime settings and background art! For this round, the weekly review is going to be a little different from what you’re used to. For the first time since I started writing this report in 2012, I don’t feel there are any series that present a compelling case for detailed analysis each week. This is not to say that the shows in this winter’s lineup are bad or uninteresting, but they feel more like a collection of side dishes, none rising to the level of main course. It is telling that, while people are briefly noting interesting details as they arise, the level of activation among butaitanbou-sha is very low, even by cold weather standards. 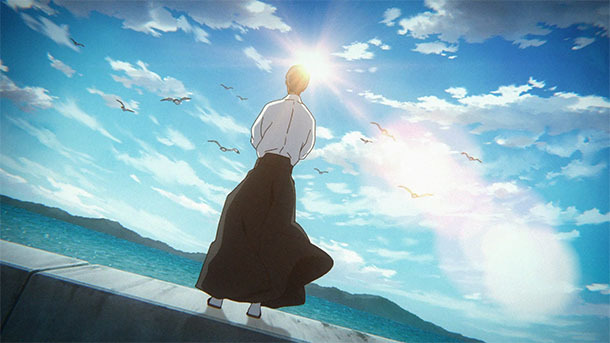 While it’s always possible some series may blossom late, I think this season it will be sufficient to just have a general sense of what’s going on, rather than getting down in the weeds with particular shows. There won’t be screencap analysis, but everything else is unchanged. Media and general interest, and reports on pilgrimage activity will continue as always. If something particularly notable and exceptional arises in a particular show, I may include a special section to cover it. Girly Air Force (Satelight) is set in Komatsu, Ishikawa Prefecture. It’s deep into military and fantasy themes, with many scenes taking place inside Komatsu Air Base, though parts of the city are also used. It does have a subtle feeling of tourism promotion, with characters making rounds of the city to appear briefly in front of “postcard” locations and local businesses. Kemurikusa (Yaoyorozu) I had planned to watch just for fun, assuming it was a fictional setting, but the first area in the post-apocalyptic world is actually modeled on Hashima, nicknamed Gunkanjima (Battleship Island) in Nagasaki Prefecture, and the OP uses imagery from Umeda Station in Osaka. Boogiepop wa Warawanai (Madhouse) has thus far used only a handful of Tokyo locations during transitions, but I’m hoping this may be a late bloomer. I’m more interested in the storytelling and soundtrack. Watashi ni Tenshi ga Maiorita! (Doga Kobo) includes a neighborhood Sakuragaoka, Tama, Tokyo Metropolis. This may be an opportunity to sate nostalgia for Mimi o Sumaseba and Isshūkan Friends. pilgrimage. BanG Dream! 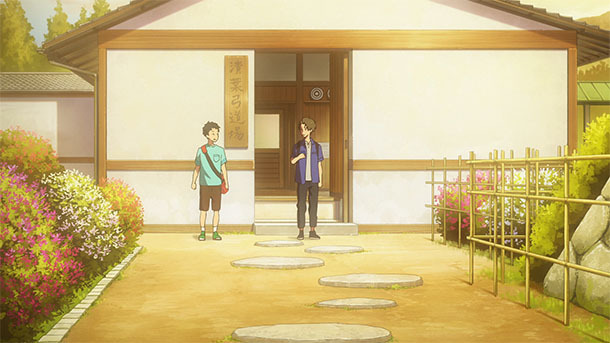 2nd Season (Sanzigen) has a new studio and the backgrounds seem less detailed, though we are once again treated to the Toden Arakawa Line as it threads through Kita, Toshima and Shinjuku wards, and pathways along the Kanda River in Tokyo. W’z (GoHands) is a direct sequel to Hand Shakers. It returns to the same Osaka setting, and unfortunately resumes the same vertigo-inducing animation style to go with it. 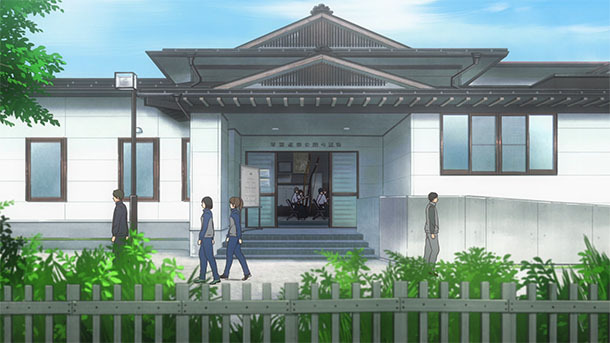 Go-Tōbun no Hanayome (Tezuka Productions) uses a few street scenes from Ōtamachi, Tōkai, Aichi Prefecture during transitions. 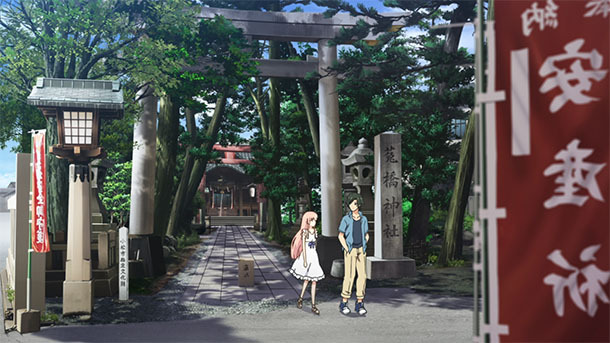 Circlet Princess (Silver Link) includes scenes in futuristic versions of Yūrakuchō and Marunouchi in Chiyoda Ward; and Machida (all Tokyo Metropolis). 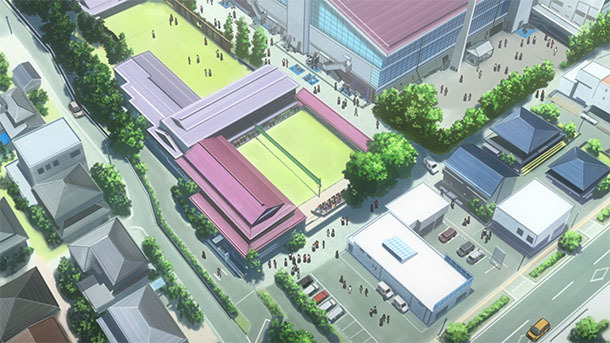 Date A Live III (J.C.Staff) is set in Machida, Tokyo Metropolis. 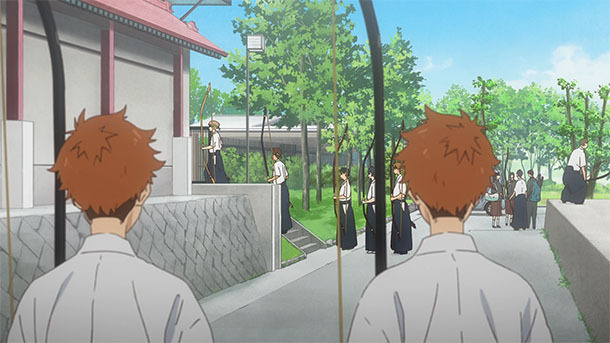 Domestic na Kanojo (Diomedéa) uses several Tokyo locations in its OP, including Shibuya, Omotesandō and Ebisu, and there is a scene in Takadanobaba in the first episode. Mahō Shōjo Tokushusen Asuka (Liden Films) includes scenes in Shibuya, Iidabashi, Kagurazaka and other Tokyo locations. Revisions (Shirogumi) is Shibuya beset by disaster and active conflict. 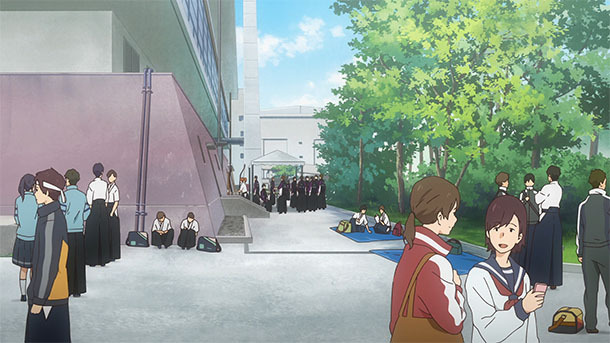 Egao no Daika (Tatsunoko Production) uses Sendagaya, Jinnan and other areas in Shibuya Ward as part of a simulation, but is set in a future fictional world. Sankei Shimbun published an interview with Sakata Atsushi from the Kuki City Commerce and Industry Association, reflecting on pop culture tourism for Lucky Star. 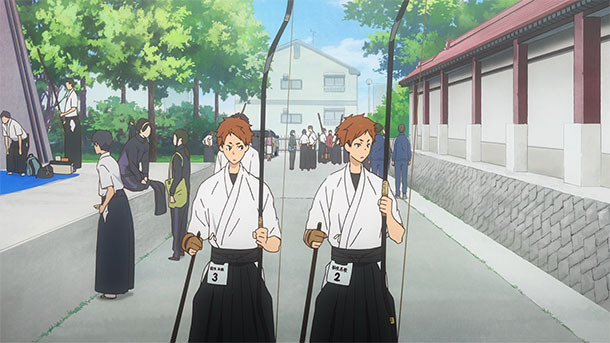 Hanako published an article about shrines that appear in Hanasaku Iroha and Yūki Yūna wa Yūsha de Aru. 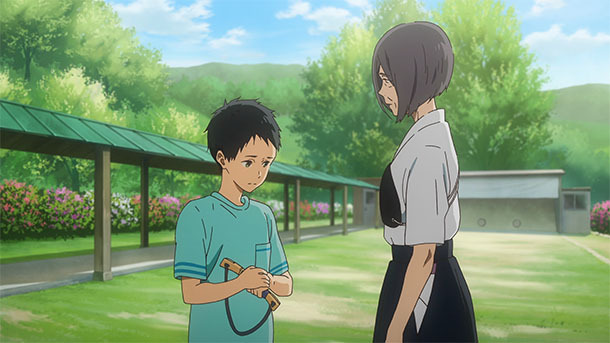 @optiange published a report on the Tamako Market and Tamako Love Story showings at Demachiza, the small and independent cinema in the Demachi Masugata Shōtengai in Kyoto. @hi_ppopotamus made a pilgrimage (tweet 1, tweet 2) to Nagano City, Nagano Prefecture for multiple episodes. We never did figure out the model for Saionji-sensei’s training hall, or if one even exists. @etesuke made a pilgrimage to Komatsu, Ishikawa Prefecture for Girly Air Force Episode 1. @flyingbird1124 made a pilgrimage to Osaka for W’z Episode 1 and Episode 2. @touyoko_com made a pilgrimage to Sakuragaoka, Tama, Tokyo Metropolis for Watashi ni Tenshi ga Maiorita! @ssslocation made a pilgrimage to Ōtamachi, Tōkai, Aichi Prefecture for Go-Tōbun no Hanayome. @ssslocation made a pilgrimage to Chiyoda Ward and Machida, Tokyo Metropolis for Circlet Princess. @touyoko_com made a pilgrimage to Machida, Tokyo Metropolis for Date A Live III. @ssslocation made a pilgrimage to the Shibuya central business district, Omotesandō, Yebisu Garden Place and other Tokyo locations for Domestic na Kanojo OP and ED. @ssslocation made a pilgrimage to Shibuya Ward, Tokyo Metropolis for Revisions. @ssslocation made a pilgrimage to Shibuya Ward, Tokyo Metropolis for Egao no Daika. The official website of Glover Garden in Nagasaki published an article about pilgrimage locations on the grounds for Irozuku Sekai no Ashita kara. @lidges made a pilgrimage to Ureshino and Imari, Saga Prefecture for Zombie Land Saga. @nagisaya_blog made a pilgrimage to Karatsu, Saga Prefecture for Zombie Land Saga. @NeoVenezia2301 made a pilgrimage to Numazu, Shizuoka Prefecture for Love Live! Sunshine!! @mikehattsu made a pilgrimage to Uji, Kyoto Prefecture for Hibike! Euphonium. @nagisaya_blog made a pilgrimage to Nagasaki City, Nagasaki Prefecture for Gen’ei o Kakeru Taiyō. @flyingbird1124 made a pilgrimage to Kōbe, Hyōgo Prefecture for Fate/stay night, Fate/Zero and Fate/kaleid liner Prisma Illya. @mikehattsu made a pilgrimage to Yawata, Kyoto Prefecture for K-On! @mikehattsu made a pilgrimage to (post 1) Miyakojima Ward, Osaka; (post 2, post 3, post 4) Suita, Osaka Prefecture; and (post 5) Yawata, Kyoto Prefecture for Clannad After Story. @yomikatajiyu made a pilgrimage to Tokyo and Tanegashima, Kagoshima Prefecture for Byōsoku Go Senchimētoru (5 Centimeters per Second). English seems to be common language for most countries, the video would be great if you captions in a subtitle setting. How is my cousin Mike and family doing? hope all is well. Hi Vince- In general, the only things that get subtitled are official releases of series and films. Advertisements, with few exceptions, are intended for domestic audiences only. This is low budget, web-only advertising for a film that will only be released in Japan.